I once again have the privilege of reporting to you that this year has been another very successful one for Minerva Canada. 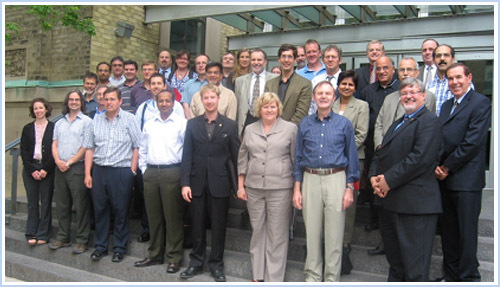 Our 2010 Summer Institute drew a record attendance from 28 professors from across Canada who are interested in promoting post-secondary health and safety education in their institutions and teaching it to their students. A special thanks to the University of Toronto for hosting it and to Graeme Norval and the Summer Institute Planning Committee for organizing it. I was also very pleased to see the University of Calgary inviting Minerva to assist in organizing and participating in a one-day Institute in May with over 30 professors from Alberta. This new initiative was a great success and we’re looking forward to more of these Institutes at other universities next year. [l-r] Elizabeth Mills, President & CE0, Workplace Safety and Prevention Services of Ontario, Tony Pasteris, Chairman & President, Minerva Canada, and Tom Beegan, Chief Prevention Officer, Workplace Safety and Insurance Board. This January, Minerva increased its participation in the Inter-Collegiate Business Competition (I.C.B.C.) at Queen’s University as a Platinum sponsor and contributor of its first-ever Human Resources Health and Safety business student competition. Thanks to Minerva Working Committee member Deborah Zinni of Brock University for writing two excellent case studies for the competition. In addition, Minerva Board Members Peter Sturm, Vic Pakalnis, Marcel Pouliot, Nina Mankovitz, and I had the pleasure of acting as judges for the final round of the competition. I’m also grateful to the University of Manitoba and Queen’s University in Ontario for inviting myself and some Minerva Board members to present the Minerva James Ham Safe Design Awards to a group of engineering students. This summer, Minerva made a submission to the Expert Advisory Panel on Occupational Health and Safety, comprising safety experts from labour and employer groups and academic institutions. This panel is charged with researching best practices which improve workplace safety in national and international jurisdictions. These and the many other efforts to advance and promote health and safety education in our Canadian post-secondary teaching institutions require, of course, ongoing financial support for Minerva’s programs. We are once again grateful to our private-sector donors without which we could not function. We have also enjoyed great support from Elizabeth Mills, the inaugural President and Chief Executive Officer of Workplace Safety and Prevention Services (WSPS) of Ontario. For those unfamiliar with the WSPS, all Ontario health and safety associations have recently been amalgamated into four, of which Elizabeth’s organization is one. We’re pleased to be working with the new amalgamated WSPS and we hope to work with the other Health & Safety Ontario partners in the days to come. Welcome aboard, Elizabeth. We’re continuing with new initiatives for 2011. We have approached the Ontario Workplace Safety and Insurance Board (WSIB) for a grant to develop and deliver teaching modules to use with engineering undergraduate students. If successful, this will begin as a pilot project at the University of Western Ontario, Queen’s University and the University of Toronto. I wish to thank our many volunteers from industry, government, academia, and health and safety associations who make up our Board of Directors and Working Committee for their endless dedication and assistance. Engineering faculty from across Canada gathered at the University of Toronto for this year’s Summer Institute. . Presented by Minerva Canada and its dedicated sponsors, the two-day event was spearheaded by Graeme Norval, Associate Chair and Undergraduate Coordinator, Department of Chemical Engineering and Applied Chemistry, University of Toronto, and the Summer Institute Planning Committee and Minerva Board members who participated with presentations and panel discussions. “Somebody needs to be driving the bus. Leadership is required to change the cultural mindset. You need to make the rule, teach the rule…then follow the rule.” Claudio Girolami, Vice-President – Automotive Systems, Robinson Solutions Inc. Governments and industry look to post-secondary schools to assist in making the workplace safer by integrating health and safety concepts into the curricula. A number of speakers reached out to the educators at the Institute. The participants were not merely presented with challenges. Many ideas and recommendations were brought to the table. WorkSmart Campus – online education tool for post-secondary students. Prevention of major industrial accidents, International Labour Office (ILO)– excellent guide on how to prevent major industrial accidents. 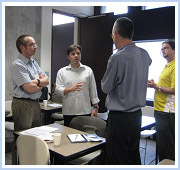 Minerva Canada also held a one-day Institute at the University of Calgary in May 2010 where over 30 professors from various Alberta universities and colleges attended. See Regional Reports for more. Syed Ahmed, Senior Process Safety Engineer from Imperial Oil, and Renzo Dalla Via from Minerva’s Board of Directors attended a luncheon seminar in January with engineering students from the University of Toronto to discuss young worker health and safety. Students raised numerous questions on cultural issues needed to affect change in safety performance and looked for leading practices within corporations to better train young workers and new employees. Minerva Canada continues to be receptive to visiting universities to discuss the need for integrating more H&S education into engineering curricula. [l to r] Tony Pasteris, Minerva Canada, with first place 2010 James Ham Safe Design Award winners Zhi Li, Andrew Le, Michael Holliday, Alex Hammond, and Romain Coudiere, from the University of Manitoba, and Doug Ruth, Dean of Engineering, University of Manitoba. 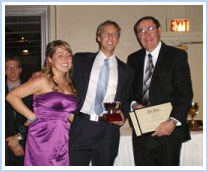 Each year, Minerva Canada challenges Canadian engineering students to make an original contribution to integrating safety into engineering design through the James Ham Award, which seeks to raise awareness of Process Safety Management (PSM) and Safety, Health and Environment (SHE) in engineering schools. It also encourages students and engineering faculty to integrate safety into all designs, thereby producing safer designs of devices, processes, and systems. This year, University of Manitoba undergraduate engineering students Romain Coudiere, Alexander Hammond, Michael Holiday, Andrew Le, and Zhi Li took first place for designing enhancements to facilitate the inspection of a rocket motor case. The enhancements should serve to reduce the risk of musculoskeletal injuries to workers by providing the primarily older workers with cameras to perform the otherwise difficult (and dangerous) inspection. “It was nice to be recognized,”says Alexander Hammond. “Raising safety awareness is very important, especially early in school. This competition really prepares students for what comes after school because health and safety is a focus that companies have.” The company Alexander works for, Bristol Aerospace Ltd., will be implementing the design from this competition in September. Alexander admitted also liking the fact that winning the award is good for a young person’s resume. [l to r] Tony Pasteris, Minerva Canada, Jeremy Langburt (student winner), James McLellan, Chemical Engineering, Mathematics and Statistics, Environmental Studies, Queen’s University, Jesse Williams-Kovacs (student winner), David Mody, Department of Chemical Engineering, Queen’s University, Wilson McKinnon (student winner), Kevin Smiley (student winner), Minerva Board members Nina Mankovitz, E.I. DuPont Canada, and Vic Pakalnis, Department of Mining Energy, Queen’s University. The award honours James Milton Ham, whose Royal Commission Report on Health and Safety led to the creation of the Ontario’s Occupational Health and Safety Act in 1979 and the adoption of the Internal Responsibility System in Ontario workplaces. The winning team was awarded the first prize of $3,500 while the runner-up team received $1,500 from Minerva Canada President and CEO Tony Pasteris during ceremonies at each of the two universities. The submissions are judged by members of Minerva’s Board and Working Committee that included John Stroyan, Vic Pakalnis, David Meston and Tony Pasteris. This January, Minerva was proud to be a major part of the Inter-Collegiate Business Competition (I.C.B.C. ), Canada’s premier undergraduate business case competition, hosted at Queen’s University. Minerva Canada was a platinum sponsor of the first ever Human Resources event in the competition, with Board members Peter Sturm, Vic Pakalnis, Marcel Pouliot, Nina Mankovitz, and Tony Pasteris acting as judges for the final round of the competition. Each of the six university team finalists had two students and about five and a half hours to prepare a presentation based on the analysis of a case study prepared by Minerva Working Committee member Deborah Zinni of Brock University. She also wrote a case study for the preliminary round of the competition which included close to 25 university submissions across Canada. [l to r] I.C.B.C. Human Resources event first prize winners Catherine Guba and Jared Grossman from Laurier University, with Tony Pasteris.. The final case study, focused on health and safety, included cultural diversity, labour relations, communications, H&S analysis, and change management issues. Very well received by the students and professors, it generated much discussion from the six teams who gave outstanding professional presentations. The inaugural first prize went to Wilfrid Laurier University’s Jared Grossman and Catherine Guba, second place to Concordia University’s Rebecca Golt and Louis Martyres, and third place to the University of Calgary’s Kathleen Hosfeld and Kali Taylor. Minerva plans to continue sponsoring this event in 2011. For more information, visit www.icbconline.ca. Congratulations to the 2009 R.W. 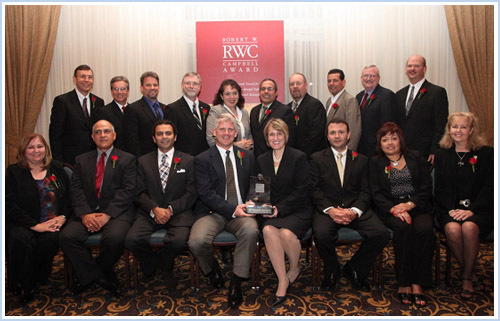 Campbell Award winner Schneider Electric North America, a global specialist in energy management. Minerva’s Tony Pasteris was one of the judges who helped decide the winner of this international award which recognizes achievement of business excellence by the integration of EHS management into operating systems. Supported by 22 Global Partners including Minerva Canada, this award looks for measurable EHS achievements linked to productivity, profitability, and other vital business markers. With operations in over 100 countries, Schneider Electric offers integrated solutions across multiple market segments, and features safety, health, environment, and community as the pillars of its business strategy. The company impressed the Campbell Award’s international review panel with its global foundation for safety and health practices that encourage local innovation. It was also praised for its seamless integration of safety procedures and mindset that protects employees on and off the job. The judging panel for the 2010 Campbell Award submissions included Minerva Board Member Len Hong, President and CEO, Canadian Centre for Occupational Health and Safety. The 2010 winners will be announced later this year. Visit www.CampbellAward.org for more. 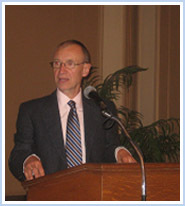 A presentation by Graeme Norval from the University of Toronto on Minerva Canada and some leading practices for teaching occupational health and safety in engineering schools was delivered at Queen’s University during the June 2010 Canadian Engineering Education Association (CEEA) Conference. Minerva’s Vic Pakalnis and Tony Pasteris were also present to take questions from the audience. 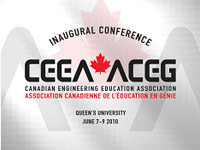 The CEEA is a new organization whose mission is to enhance the competence and relevance of graduates from Canadian engineering schools through continuous improvement in engineering education and design education. “Its next meeting is in St. John’s (Memorial University) in early June – and it makes for a great link for both parties,” says Graeme. Minerva congratulates retiring Judy Fraser, chair of Minerva Manitoba for all her hard work and many accomplishments in young worker health and safety education. 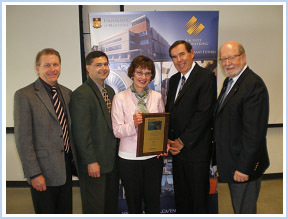 Judy, shown here with (l to r) Daryl Nielsen, Red River College, Danny Mann, University of Manitoba, Tony Pasteris, Minerva Canada and Ron Britton, University of Manitoba, accepts an award presented by Minerva Canada. Minerva Canada, with help from its key partners, is planning to develop a number of health and safety (H&S) modules to be delivered in 2011 to engineering schools in Ontario. University of Toronto, University of Western Ontario, and Queen’s University have all agreed to pilot the modules in their engineering departments. These modules will be designed to address several issues raised at Minerva’s Summer Institutes. First, they would help meet the needs of academics who want to integrate H&S content into existing courses, but may lack knowledge and confidence in teaching H&S. In addition, the safety culture in post-secondary institutions is an evolving one and these modules will help move this cultural change forward. Industry, the Ontario government, H&S associations, and the Canadian Engineering Accreditation Board need graduates who know how to manage, measure, and improve on H&S performance and have a keen understanding of safety before they are employed. Today’s engineering graduates have more responsibility and less time to acquire this knowledge in the workplace. Due to downsizing, there are fewer, if any, personnel available to mentor new hires. Furthermore, if H&S is taught as a technical skill rather than a mindset and management issue, new grads will struggle to infuse the right H&S culture in their organizations. The business case studies that clinched it for the first four winners of the R.W. Campbell Award are now available, along with synopses and insights from the winners. Those companies include: Noble Corporation, Johnson & Johnson, DynMcDermott, and Alcan. Send requests for the case studies to CampbellAward@nsc.org. 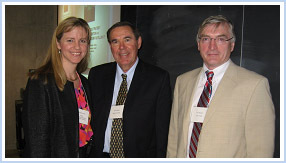 June 2011: Canadian Engineering Education Association (CEEA) Conference, Memorial University, Newfoundland. Visit http://ceea2010.preview.appsci.queensu.ca/index.htm for more. The Ontario prevention system recently restructured its programs and services to better assist Ontario businesses in reducing the number of injuries, illnesses, and fatalities in their workplaces. As a result of these changes, 12 of the province’s health and safety associations have amalgamated to form four new organizations. One of these organizations is Workplace Safety and Prevention Services of Ontario, which includes Farm Safety Association (FSA), Industrial Accident Prevention Association (IAPA), and Ontario Service Safety Alliance (OSSA). Visit www.healthandsafetyontario.ca for more information.